The heaviest New Year's Eve guitar jam ever: Hendrix does "Machine Gun"
For many years I listened to a cassette tape recording of the sacred New Year's Eve (1969) performance of "Machine Gun" on my home stereo (and my Walkman, when I wanted to feel elevated as I loped down the sidewalk). In the late '90s I bought the CD to better hear the glorious Stratocaster tones, and that was enough. I was grateful the recording existed and never imagined being able to see the magical (spontaneous) Hendrix creative process at work. In the early '00s I happened on a VHS documentary which featured snippets from the famous live recording of "Machine Gun" with awed commentary from Lenny Kravitz. This was like finding the Holy Grail. I rewound the tape a few times and told myself I'd rent the video again when I needed a fix. And on the eighth day, programmers created Vimeo, where I can now watch the video below whenever fancy strikes. How many ways do I love thee? The black and white film strips this down to the music and the music alone, as it should. 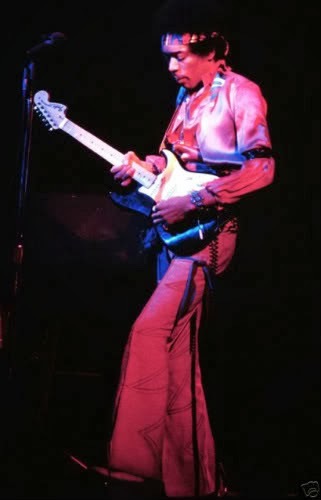 Then there's Jimi Hendrix tuning, like a mere mortal, and improvising for the first 90 seconds, because he can. Even as history is in the making, the camera eye slips into a psychedelic cloud at 3:48. At 4:19, we have the grandest, most balls-out string bend ever committed to fretboard, akin to a suspended air raid siren, as The Solo to Beat All Solos starts. At 7:21, when Hendrix could easily go back to the verse, he instead continues on with more wah-wah pedal gravy. And all the while as Jimi steers this three-and-a half minute, mellifluous solo, he barely looks at his guitar, as if it were an appendage. here for "It was 70 years ago today: an appreciation of Jimi Hendrix"
here for "Link Wray's 'Rumble'"
here for "Great Guitar Solos, #1: Eddie Hazel (Funkadelic)"
here for "Great Guitar Solos, #2: Frank Zappa"
here for "Great Guitar Solos, #3: Hiram Bullock"
here for "Great Guitar Solos, #4: Dweezil Zappa Nails 'Eruption'"
here for "Great Guitar Solos, #5: Alvin Lee"
here for "Great Guitar Solos, #6: Neil Young's 'Hey Hey, My My'"
and here for "Shut Up 'N Play Yer Guitar - The Six-String Wizardry of Frank Zappa, Part II"
The Ronettes - "Frosty the Snowman"
Some years ago I received the Phil Spector boxset as a Christmas present and discovered "A Christmas Gift for You from Phil Spector" inside. I can take or leave most Christmas pop, but in time the Wall of Sound, girl group interpretations of Yuletide classics grew on me. (Click here for the full album). Bing and Bowie sing "The Little Drummer Boy/Peace on Earth"
I'm a guitarist who loves the drums. In my late teens and early twenties (my hard rock/metal years) I was a disciplined air drummer. When I couldn't "play" a part I rewound the tape as many times as were necessary until I "had it down." In my thirties, I had a chance to sit behind a real drum kit and became a passable four-four drummer in a jam rock context. And I've always listened closely to drums. Other than the complicated rhythm patterns of Elvin Jones and other jazz giants, I can generally visualize drum parts that I can't play. When I hear a skilled drummer, I'm instantly engaged in both heart (the rhythmic vibe) and head (the technique). 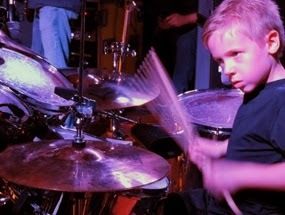 Which brings us to seven-year-old drummer and Internet phenomenon Avery Molek. My first exposure to Avery was the below rendition of "Hot for Teacher," recorded when he was just six. Van Halen was my favorite band at the time this song was on the airwaves, so I was intimately familiar with the drum track. Though Avery didn't use four bass drums in the introduction as Alex Van Halen did, he mostly blows through the rest of this song. Watching Avery the first time, I experienced cognitive dissonance; it was hard to wrap my head around the image of a little boy with such advanced motor skills. But what impressed me even more was Avery's interpretation of "Girl Gone Bad," off of "1984," the last release by the original--the only--Van Halen. One, I'm impressed Avery found and learned an underappreciated deep album track which came out twenty years before he was born (according to Avery's website, he chooses what to play). Two, though "Hot for Teacher" has a famous introduction, to my ears "Girl Gone Bad" has a more aggressive and dynamic drum track which offers a better window into the primal (and precise) power of Alex Van Halen. For closeness of interpretation, I tip my hat to Avery's version of "Enter Sandman." Though I'm much more partial to the material on the early Metallica albums, I've heard this song (and visualized the drum parts) many, many times simply by existing these past two decades. I would be willing to bet that Avery's technique in this video is not noticeably different than Lars Ulrich's. Something tells me this kid has a bright future. This question lies beneath the surface of "Nebraska," the latest release from Alexander Payne ("Election," "Sideways," "The Descendants"). The story is driven by Woody Grant (Bruce Dern), a 70-something Montana man of few words. Woody is disconnected from those around him physically (he has bad hearing and is averse to eye contact) and metaphorically. Kate Grant (June Squibb) heaps scorn on her husband for his drinking problem and shortcomings as a father; Woody's oldest son Ross (Bob Odenkirk), a local newscaster, sees him in an equally unflattering light. They both want to place him in a care facility. 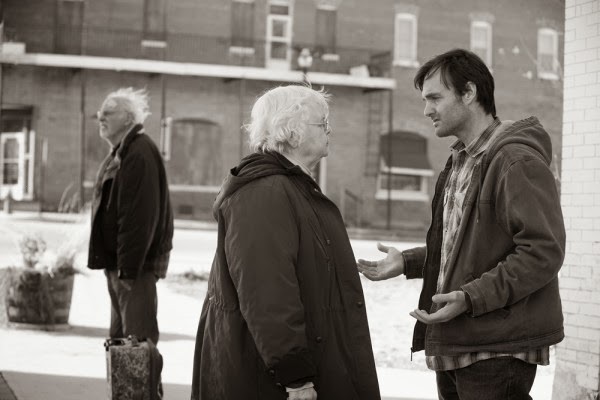 "Nebraska," Woody needs something to believe in. Scenes of Woody hobbling along a highway, a hospital sidewalk, railroad tracks--seemingly lost but utterly determined--recur throughout the movie. stereo salesman played by Will Forte. David, who is much more forgiving than his mother and brother, indulges Woody's wish to travel to Lincoln, Nebraska to redeem his winnings. An unexpected development on the road trip takes father and son to Woody's home town of Hawthorn, Nebraska. In Hawthorn, Woody reconnects with family and friends from deep in his past, including Ed Pegram (Stacy Keach), a former business partner and one of many people trying to angle in on Woody's apparent million-dollar windfall. Some of the characterizations feel like caricatures, narrative shortcuts used to depict static aspects of small town life, but there are amusing moments. Along the way, David learns things about his father that he never knew. Where all of Payne's movies have elements of sadness leavened with humor, "Nebraska"--which lacks the dynamic comic presence of Matthew Broderick ("Election") or the Paul Giamatti-Thomas Haden Church duet in "Sideways"--leans more toward the former. The humdrum nature of the characters' lives is reflected in the black and white film stock and the winter setting: snow blankets everything, and the trees are barren. The landscapes tend to be flat, the vistas far-reaching but gray and empty. When an act of kindness comes at the end, it's hard to shake the cumulative melancholy of the first 100 minutes. 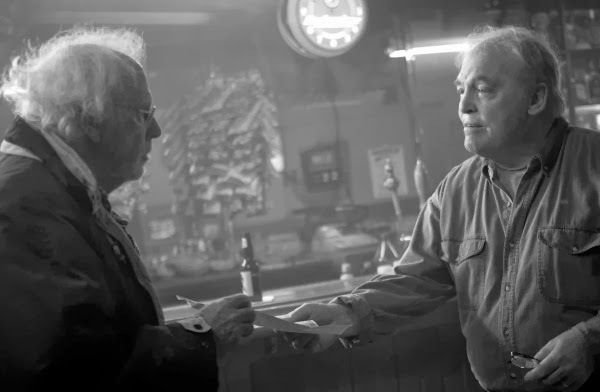 Even so, "Nebraska" has stayed with me all week, and like many of Alexander Payne's other movies, I suspect that it would yield riches on repeated viewings. more Zappa on "Truth and Beauty"
Great Guitar Solos, #4: Dweezil Zappa Slays "Eruption"
Last year, around the time a push button confection was taking the pop world by storm—on its way to knocking the mighty Justin Bieber out of the top spot in YouTube views—I was struck by an urge to write about the flesh-and-blood guitar stylings of Frank Zappa. 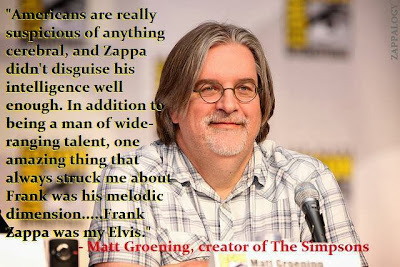 Zappa's best work was decades in the rearview mirror, but I forged on with the assumption that my ode to Zappa would be a low-traffic niche post, an act of public service on behalf of timeless art. To my surprise, the post was a hit. It drew a steady stream of readers and became the most read post in the great guitar solos series by a factor of four. Today, on the 20th anniversary of Zappa's passing, I will re-visit the vaults to once again celebrate a musician who mattered. We open with "Stinkfoot" off of the 1974 classic, "Apostrophe." This performance arguably features Zappa's strongest lineup, the band which included Napoleon Murphy Brock, Ian and Ruth Underwood, and George Duke that recorded both "Apostrophe" and its predecessor, "Overnite Sensation." 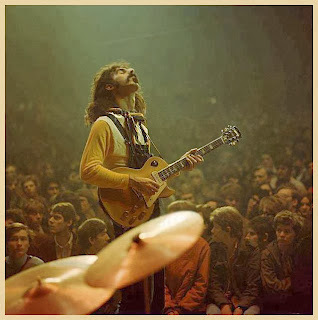 Here Zappa plays his signature Gibson SG, with a wah-wah pedal for spice. A helpful Zappa fanatic cut out the beginning and end of the song so we can treasure Frank's wailing guitar in isolation. "Muffin Man" has one of Zappa's most recognizable riffs, the kind of big, lumbering riff that roamed the land during the dinosaur rock era. This recording from 1977 includes a twofer: a tasty blues bends-and-flash lead from the estimable Adrian Belew at 1:00 followed by Zappa's epic solo. Highlights include Frank's nifty use of hammer-on pull-offs with his fretting hand so he can slap skin with members of the audience at 2:17, the impossibly rapid flurry of notes at 2:49, the fretboard close-up at 3:28, and the dry ice vapors rising from the stage, a sign that some truly heavy rock was in the air. "Chunga's Revenge" is a fusion instrumental that Zappa performed live. Using a sunburst Les Paul which wasn't a regular part of his rotation, Zappa starts out quietly to get the crowd warmed up. The distorted vibrato at 2:43 signals that Frank is about to let rip with anarchic fury and attendant gyrations. (*Added bonus: the YouTube discussion thread for this video has a debate for the ages about technique for technique's sake v. the power of jagged, authentic expression). The live version of "Watermelon in Easter Hay" below features Zappa with a Stratocaster and a huge (yet well-rehearsed) backing band. As with "Black Napkins," the guitar moves seamlessly between a main melody, serrated fills, and improvised solos. No less an authority than Dweezil Zappa called the studio version of "Easter Hay" "the best solo" his father had ever played. That's a big claim, but if by "best"one means most lyrical and most beautiful, I'm inclined to agree. here for "An appreciation of '1984' as Eddie Van Halen turns 60"
here for "Great Guitar Solos, #8" Freddie King's 'San-Ho-Zay'"